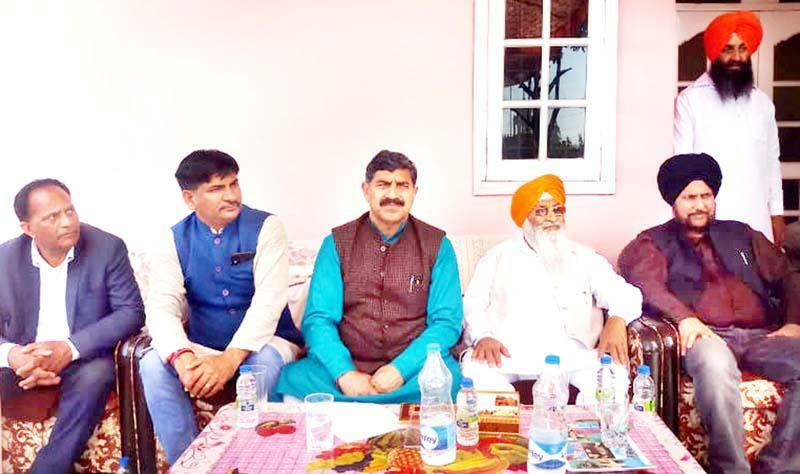 JAMMU: Jugal Kishore Sharma Member of Parliament from Jammu-Poonch, Lok Sabha Constituency Sunday highlighted various developmental works undertaken by him in the Constituency during last five years. The MP was addressing various public meetings during his tour to Lakkar Mandi in Jammu West Assembly Constituency, Simbal Camp in RS Pura, Constituency & Phallain Mandal in Marh Constituency. He was accompanied by MLC, Charanjeet Singh Khalsa, former Minister, Satpal Sharma, Sukhnandan Choudhary & Ex MLA, Gharu Ram, Ex VC Bhushan Dogra and senior leaders of party. He said that BJP is the worldwide largest party working on the agenda of " Sabka Saath Sabka Vikas " and the various development projects which are being executed in Jammu Poonch -Constituency by his painstaking efforts, like widening and upgradtion of Satwari-RS Pura and Suchetgarh road under Central Road Funds (CRF) was the burning demand of inhabitants. He said people will be benefitted with the widening of the road in the twin constituencies. Many works also executed like construction of 19000 individual as well as community bunkers in border villages which would bring relief to the border residents during cross border shelling from Pakistan. Many major projects were started like four lanning of road from Jammu to Akhnoor and widening of the road upto Poonch. Member of Parliament also inspected various development works in Simbal Camp which are being executed under MPLAD Funds. Addressing the Sikh community present on the occasion he said that only Modi Government has made provision for dedication of 2000 crore to provide respect to the refugee families and only in his tenure Rs 5.50 lac were paid to every refugee family and it is not the end more will follow. Joining Programme was also held at Lakkar Mandi in Janipur, in which Corporator, Subash Sharma along with his supporters of Ward Number 36 in large number joined Bharatiya Janata Party in his presence. State general secretary, Dr. Narinder Singh, State Working Member, Kuldeep Magotra, State Kissan Morcha, president Rajinder Singh Chib, Prabhari Aseem Gupta, district presidents Ayodhya Gupta, Brijeshwar Rana, Omi Khajuria, State president, Yuva, Vikas Chaudhary, & others also present in the public meeting.